Debuting at the 2018 Pebble Beach Concours d’Elegance during Monterey Car Week, the 2019 Z4 looks very similar to the Z4 concept BMW unveiled at Pebble Beach last year. The two-seater maintains the long hood and short rear deck proportions of the outgoing Z4, but the large kidney grille, pronounced front air intakes, and muscularly sculpted hood give the new car a sportier overall look. 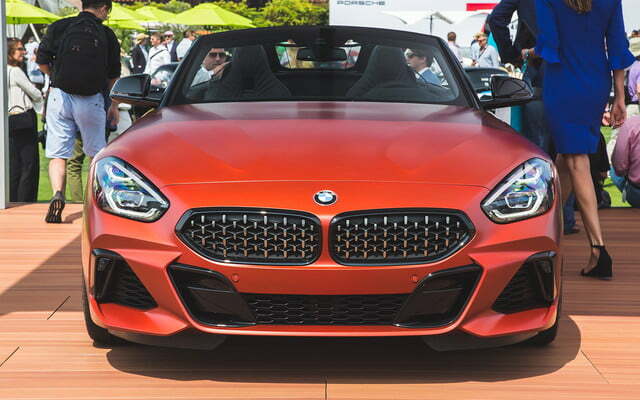 BMW is only showing the Z4 M40i First Edition model at Pebble Beach; details on other models will follow at a later date. The First Edition is powered by a 3.0-liter inline-six that sends 382 horsepower and 369 pound-feet of torque to the rear wheels. With that engine, the Z4 will do 0 to 60 mph in less than 4.4 seconds, according to BMW. The automaker also promises a 50/50 front/rear weight distribution, which should benefit handling. BMW will not discuss transmission choices at this time, but photos provided by the automaker only show an automatic. The Z4 M40i First Edition gets some extra performance goodies, including sportier suspension with electronic dampers, upgraded brakes, and an electronically controlled M Sport rear differential. The Z4 may be a sports car, but the interior features the now-obligatory central display screen, which is tilted toward the driver and augmented by a digital instrument cluster and head-up display in the M40i First Edition. This seems questionable in a car ostensibly designed to highlight the pleasure of driving, but automakers apparently can’t resist cramming their cars with tech for the sake of tech. The First Edition also gets a Harman Kardon surround sound system, model-specific black leather interior, 19-inch wheels, and adaptive LED headlights. BMW will announce full details and specifications for every 2019 Z4 trim level September 18, and the car goes on sale next year. Despite its name, the First Edition won’t be the first 2019 Z4 model to hit U.S. showrooms. That will be the base Z4 30i, which arrives in spring 2019. The First Edition and standard Z4 M40i will show up later, in the second quarter of 2019.